Offset printing in New York City is also referred to as offset lithography . It is a printing process that involves mass production printing in which the images that are on the metal plates are usually transferred to rollers or rubber blankets and then to the print media. The print media, which is usually paper, does not get into direct touch with the metal plates. This makes the metal plates more durable. The rubber that is flexible conforms to the print media efficiently. This makes it possible for the process to be used on surfaced media that are rough including cloth, canvas and even wood. Offset printing can be applied for any size of printing jobs include small, medium and even large scale printing jobs. Currently, there are two kinds of offset printing machines that are used in publication in New York City. One of them is sheet fed offset printing, in which single pages of paper are driven into the machine. These pages can then be cut to the final size for publication. The pages can then be trimmed to the required size. It is mostly used in tasks such as printing of limited edition books. There is also web offset printing, in which higher speed and larger machines are used in the process. The machines are fed with large paper rolls and the single pages are usually separated and then, they get trimmed to the right size. It is usually applied in printing of high volume publications that change in their content regularly. Offset printing is a popular method of printed materials creation. Some of the areas where it is applied include flyers, newspaper, brochures, magazines, books and stationery printing. When you compare it with other methods of printing, like digital printing or large format printing, our NYC printing services are more effective for cost cutting large production of high quality printing work, that require just little maintenance work. Most of the contemporary offset presses make use of computer to plate systems, other than the traditional computer to film work flows. This is what makes the modern printing work of higher quality. 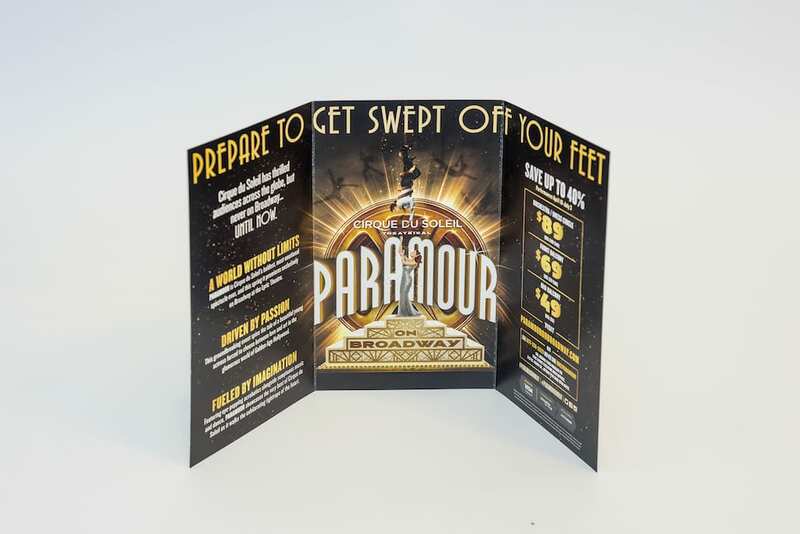 There are several benefits that you get by use of offset printing of flyers for New York events. One of its greatest advantages of our offset flyer printing service is that it produces high quality images in a consistent manner. It is known to produce clean and sharp images compared to letterpress printing. This is made possible due to the fact that the rubber blanket usually conforms more effectively to the printing surface texture. It offers fast and very easy production of printing plates. The printing plate last for a longer time compared to direct litho presses because of lack of direct contact between the printing surface and the plate. It uses high quality plates that are used together with fountain solution and optimized inks that help in achieving run lengths of a lot of impressions. It does not require a lot of labor, meaning that if you do it in your business; you save on operations costs because you do not have to employ employees to manage the printing process. In terms of cost, offset printing is the most cost effective method of production of high quality prints when it comes to commercial and industrial printing scale. Offset printing also allows the adjustment of the amount of ink on the fountain roller using screw keys. In most cases, there is a metal blade that helps in controlling the amount of ink that is transferred to the fountain roller from the ink trough. This goes a long way in modifying the colour density of the different area of the image. Offset printing can be used by any New York City Printing Company that undertakes printing work in their day to day operations. However, it will be more cost effective and efficient when used by companies that publish newspapers, books, brochures and other publications like we do here at Varick Street Litho. With the large volume of publications needed, it is a cost effective and time saving printing method to be applied. It is of great help in your business or office even if you do not do large scale printing because of its high quality products and cost effectiveness. Contact us regarding your next flyer printing project and learn how our flyer printing experts can get you a great finished product.